“Suzanne Del Rizzo both wrote and illustrated My Beautiful Birds. The illustrations are mixed media, including plasticine, polymer clay, and acrylic. 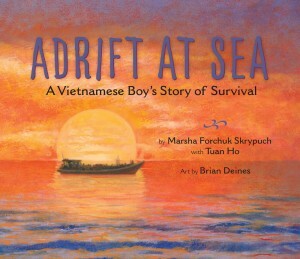 The plasticine and clay provide colourful yet dimensional illustrations to accompany the story. Two of my favourite illustrations are the powerful images of Sami’s painting of his beloved pigeon becoming covered in black smears, and, on the following page, the clouds in the purple and pink sky transforming into birds. The topics of Syria and the refugee crisis are so timely and important that I’m very pleased Pajama Press has produced a picture book to address not only the topics but also the human emotions around them….written in simple words, My Beautiful Birds is very poetic with a significant amount of depth and symbolism….The outstanding artwork, along with the multi-faceted themes, would give older elementary readers much to discuss and explore. 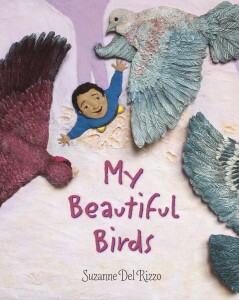 “Coming to shelves in March is Suzanne Del Rizzo’s My Beautiful Birds (Pajama Press), a new book specifically about Syrian refugees. Rendered in bright and textured polymer clay and acrylic, it’s the story of a boy named Sami, leaving his Syrian home (with a sky full of smoke) to escape war….